IBM is ready to start shipping the first commercial server systems built around its recently released Power9 processor. Dubbed the AC922 Power Systems, these servers will ship by the end of December, and are specifically designed for artificial intelligence (AI) workloads, reports Enterprise Cloud News (Banking Technology’s sister publication). The AC922 is the commercial version of the same severs that IBM, along with Nvidia and Mellanox Technologies is using to build two new supercomputers for the US Department of Energy. The “Summit” and “Sierra” supercomputers are expected to go online in 2018, and could reinvigorate the US’s standing in the world of high-performance computing. 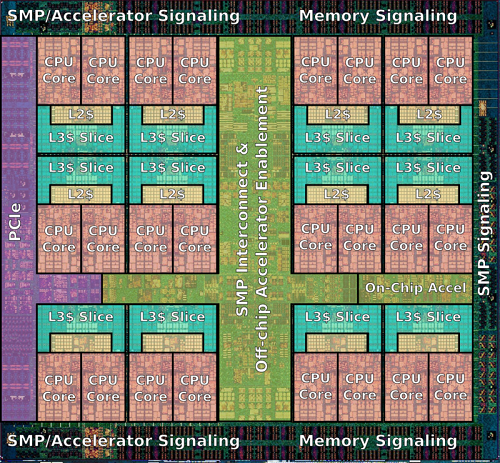 At the heart of the AC922 is IBM’s recently released Power9 processor. This 24-core chip supports a wide-range of cutting-edge technologies, including the new PCI-Express 4.0 standard, which provides double the bandwidth of PCI-Express 3.0. In addition, Power9 and the AC922 support OpenCAPI, a new connection interface that supports a range of different memory chips, including field-programmable gate arrays (FPGAs), ASICs and other microprocessors. The AC922 system also supports Nvidia’s NVlink 2.0, a high-speed interconnect with the capable of 25Gbps (bits per second) of throughput that connect will connect the Power9 chips to Nvidia’s latest graphics processing units (GPUs) called Volta. All these capabilities are designed to allow customers accelerate their AI and machine learning workloads. Over the past several months, IBM has touted the ability of its Power-based systems to handle these type of workloads and applications. Big Blue also scored a big win when Google announced interest in using Power systems for some of its larger workloads. Stefanie Chiras, vice-president of Hardware Offerings for IBM Cognitive Systems, told Enterprise Cloud News before the announcement that the type of data driving AI and machine learning is putting a new emphasis on the hardware running it, and the company believe that Power9 answers a lot of those challenges. “We certainly see the evolution of the cognitive era, along with the AI workloads, that are driving much stronger and much more aggressive requirements for infrastructure, and that includes data throughput levels, as well as compute strength,” Chiras says. Moving into this AI space, it’s really a world full of data and types of data we didn’t have before now,” Chiras adds. “There’s also a software evolution around these AI frameworks and then you culminate that with the ability of infrastructure that can keep up. Those three things coming together are really kicking off the perfect storm for the AI era. In order to support the software requirements, the AC922 will provide support for several AI and machine learning frameworks, including TensorFlow, Chainer and Caffe. These new Power9-based systems will also support any number of different application running on Linux. The combination of software support, along with the Power9 processors, Nvidia GPU accelerators and support for the new I/O technologies, makes the AC922 a unique systems to run a range of machine learning and AI applications, where that is scientific research, security or deep analytics, Chiras says. “You can train your natural language or deep learning models 4x faster on the AC922 compared to other server models,” Chiras explains. The first of these AC922 systems, which is air-cooled, will go on sale at the end of the month, while another water-cooled system is slated to hit the market in 2018, although no specific date has been set. Bustling blockchain. A compilation of the year's juiciest stories with this handy top ten. Ensure you're up to speed with the insurance scene in our top ten insurtech stories in 2018. And creates a centre to develop AI use cases.